$35,000 USD Lower Priced HandyMan Special! Address: 281 Glenwood Lane. MAKE AN OFFER!! Needs TLC and your finishing touch! Size: 1,152 sq. ft. "Plus Glassed In Lanai! " Owner ready to SELL! Located in Naples Estates, in beautiful Naples, Florida! This community is undergoing a huge transformation right now! With a new resort style pool, Clubhouse and Activity Center underway, this property will be one of the premier resort style communities when completed. Naples Estates is currently undergoing a large and beautiful transformation to the community including beautiful new palm tree lined streets, a new state of the art resort style ballroom and activity center, fitness center, new pool with spa treatment, new bocce ball courts, pickle ball courts, 18 hole miniature golf course, dog parks and more! Not only is this community close to shopping, golf, movie theater, restaurants, and banks, it is only minutes to beautiful historic downtown Naples 5th Ave. and 3rd Street shopping and our beautiful white sandy beaches! Your lot rent of $758 per month includes water, sewer, curbside trash pick up twice weekly and use of all the amenities. Two pets are permitted per home with some breeds of dogs prohibited. 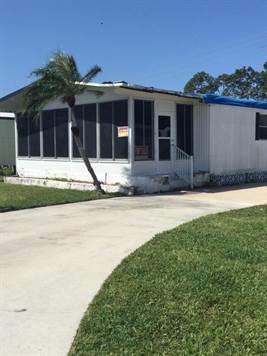 This two bedroom two bath mobile home is situated on a Cul de sac. This floor plan offers plenty of room! The Florida room is completely glassed in and has plenty of room for relaxing. All appliances are included in the kitchen. Plenty of cabinets and closet space in this home. The master bedroom and bath is extra large, and accommodates a king size bed with plenty of room. The guest room has close access to the second bath located in the hall. The Sales Price reflects that there are a few interior repairs needing finishing. THE Roof and carport need to be replaced. Once these things are complete, this will be a great year round home or vacation get a way with plenty of room for living, and entertaining. Call 239-784-2924 TO SCHEDULE A SHOWING. 55 and up Age restricted community.